On the 26 March 2009, the developers (MSF) replied to the question raised by Mark Hunter, the Town Planner in charge of Clapham Junction redevelopment proposal on the 23 January 2009 (see our previous article here – you can also read Network Rail justifications following a similar letter from Mark Hunter). 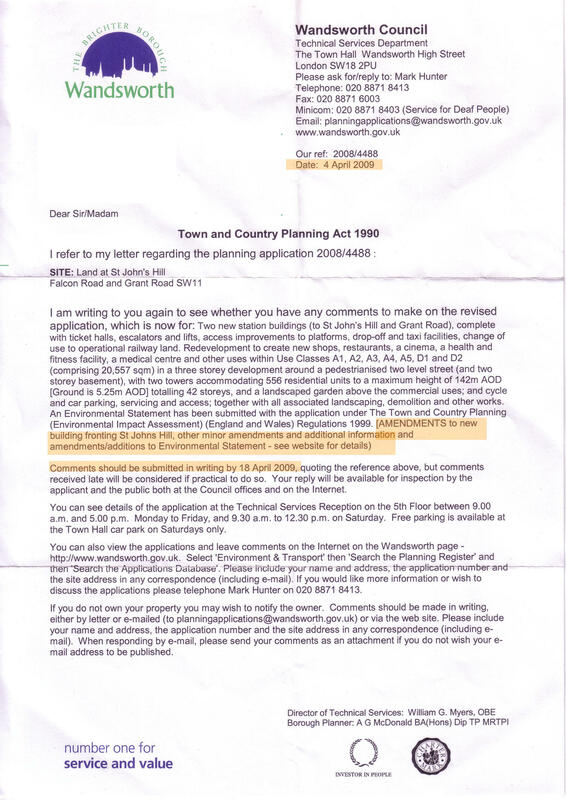 You might not have noted this event (I bet few did) as we received in the post a letter dated 4th April asking for comments to be sent up to 18th April. It is interesting to notice that the developers took more than 2 months to reply, sent a 20 page letter (amongst other documents available on the Council website) and the residents are expected to make their mind within 2 weeks. I am actually very curious to know how many people read the developers’ submission and whether it persuaded them to include new arguments in any presentation they sent to the Planning department. Feel free to comment below this article. In a previous article, Kate Williams listed the main concerns of the Planning Officer. We will be publishing reactions in further articles, including Kate Williams’ answer to the developers referring on “those objecting to the applications have chosen to refer to only a small number of these images and indeed to publish their own deliberately distorted and misleading images“, along with other resident comments.